Garapa (var. Guarapa) is the Brazilian Portuguese term for the juice of raw sugar cane (in some Southern states garapa is better known as "caldo de cana", cane juice). Left: Getting the sugar cane juice with a machine. Also known as "guarapo", "guarapo de caña" or "jugo de guarapo" in various dialects of Spanish, it is very popular in other tropical countries of Latin America as well. Sugar cane juice is especially popular among the Cuban expatriate community in Miami, where it is found in abundance at many locations in Little Havana. 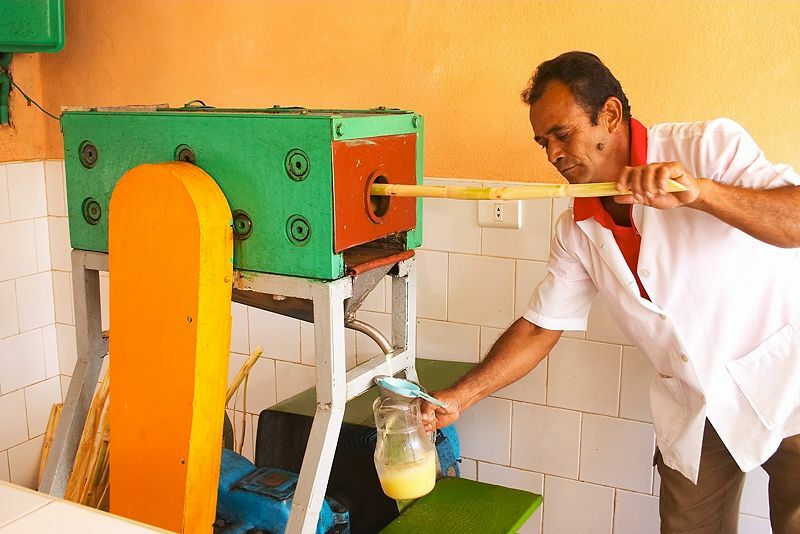 Sugar cane juice is obtained by crushing peeled sugar cane in a small hand- or electric mill. The drink is often served cold with a squeeze of lemon or key lime (in Brazil, Colombia, Cuba), pineapple (Brazil), passionfruit and ginger. Due to its high sugar content it is rich in calories. Garapa juice is the primary source of sugar cane derivatives such as raw sugar (obtained by evaporation and refining), cachaça or "caninha" and ethanol.